My full review of the move The Promise is live at the Independent Institute. This narratively complex film never loses its main focus as a story of the Armenian Genocide. Nearly three quarters of the Armenian population living in the Ottoman Empire—1.5 million men, women and children—died between 1915 and 1924 through forced marches, conscription into labor camps, rioting, and mass murder. If you want to know the origin of the term “genocide,” watch the film The Promise. Literally. The movie is billed as a romantic drama, but it’s really a well-produced, narratively complex story of the Ottoman Empire’s systematic and targeted extermination of 1.5 million Christian Armenians through starvation, forced labor, rioting, and massacres in what is now Turkey. In fact, the word “genocide” was coined in 1944 by Raphael Lemkin, who drew directly from the Turkish government’s expulsion of 2 million Armenians between 1915 and 1924 to define the practical parameters of the term. The Promise, while fiction, does a hauntingly good job of staying faithful to the story of the what is often now referred to as the Armenian Holocaust. Unfortunately, the film was sold as a romantic drama featuring a love triangle that doesn’t quite work. The love story serves a critical purpose, however, tying together Armenian internal conflict with the pogram’s political motivations and press efforts to raise global awareness of the atrocities. The acting by Oscar Isaac, Charlotte Le Bon, and Christian Bale is very good, but the chemistry for a love triangle simply isn’t there. I’ll analyze this in a later post on this blog, but all three characters need to be in sync and connected for a love triangle to work. Nevertheless, even with this shortcoming, I recommend the movie. It’s a solid film, remarkably faithful to the real-world events that inspired it, includes epic visuals and digital effects, and tells an important historical story. It’s also highly relevant to events unfolding in the Middle East today. 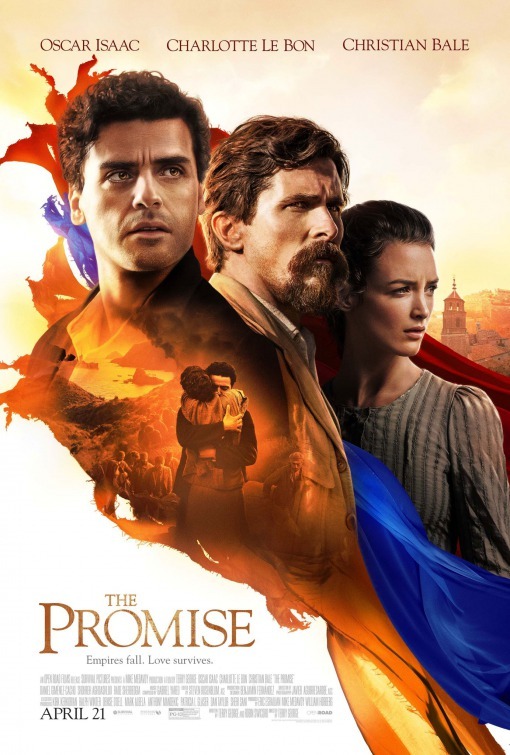 This entry was posted in Film Reviews, Films, Independent Institute and tagged Armenia, Armenian Genocide, Charlotte Le Bon, Christian Bale, film review, movie review, Oscar Isaac, The Promise on April 25, 2017 by SR Staley.